TL;DR: Facebook needs help from its less-frequent users to educate its most enthusiastic about the scourge of fake news, continuing a trend toward advertising on traditional media for the social media giant. Facebook wants to be the world’s best advertising platform, but as its own media buying habits have recently demonstrated, it has not reached that goal quite yet. 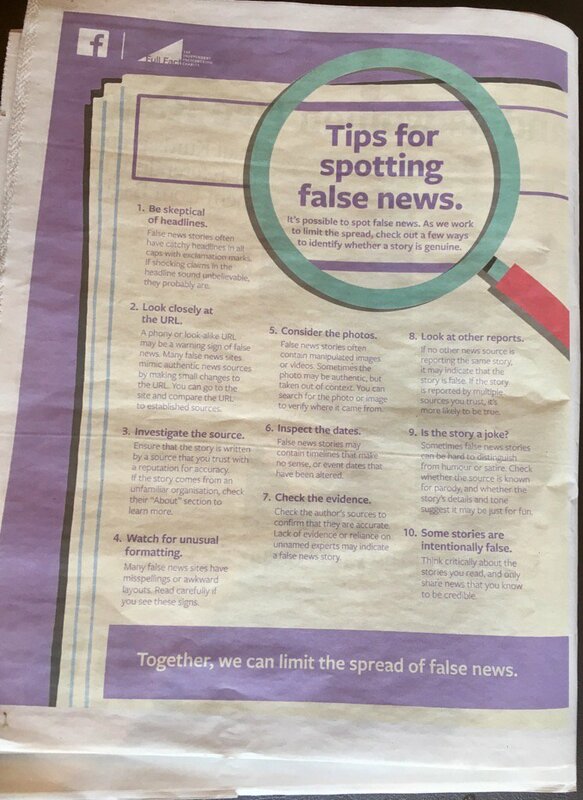 In a recent series of newspaper ads, the social media giant instructs readers how to spot “fake news.” This messaging comes on the heels of television ads for the recent Facebook Live feature. Clearly, the company feels that there is both an untapped market for its services — as ubiquitous as it seems — and that there are Facebook users who may be missing out on features or, in the case of fake news, misusing the service. The jokes are obvious. “Facebook’s own audience doesn’t pay attention to ads on its service!” Or, even worse: “Facebook is looking for an audience smarter than its own users!” There is truth behind both of these sentiments, to be sure. Facebook followers engage with the platform’s ads in a particular way, ready to click away from browsing friends’ updates only if what’s presented in the ad is instantly and uniquely appealing. And internet advertising firm Trade Desk found highly educated Facebook users were just as likely to follow fake news stories as the less-educated when the story reinforced their own view. Facebook is the victim of its own algorithm, needing to turn to traditional media to talk to the users who are willing to consider stories outside of their own bubble. These users are hard to find even on Facebook. To fight fake news, it seem that the social media platform is reaching hard-to-pin-down users who actively seek out multiple sources of news and newspapers are a natural place to find them. The hope is that they will bring their better practices to the masses as a influencers. Social media influencers spread the word of a brand or product by endorsing its message to their large audience, often using the weight of their authority on the subject. With this newspaper placement, it looks like Facebook is hoping to activate a different kind of influencer by reaching out to the well-educated, well-read users who other users trust, then getting them to weigh in on, or even report, fake news stories on the site, to educate other users. And since these well-read users tend to browse Facebook less frequently than a younger, less-educated audience, it takes more than a mobile newsfeed ad to find them. Whether Facebook will find any success combating Fake News without changing its own technology and philosophy remains to be seen, but if it’s looking to someone to do it for them, there’s no better candidate than those precious few who still love their newspapers.